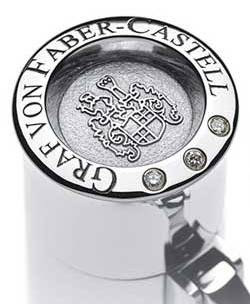 Graf von Faber-Castell "Perfect Pencil" (White Gold, Diamond Cap) is the the world's most exclusive and expensive pencil set. Only 99 pieces are made available. The suggested retail price is € 9,000. Founded by Kaspar Faber in 1761 , Faber-Castell is world's major manufacturer of wood-cased pencils. They are renowned in manufacturing of writing instruments, art supplies, staplers and slide rules, etc. in Nuremberg, Germany. At the moment, they operate the world's largest pencil factory in São Carlos, Brazil.